Published on May 30, 2016 by Martyn. Be the first to comment! Fresh back from a long round-trip to the Hay Festival, I’m gearing up for my next gig (much closer to home) in Horsforth. 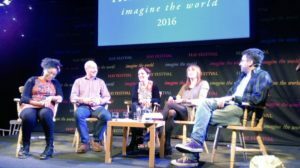 The session at the Starlight Stage, in Hay, on Saturday morning was hugely enjoyable – a panel discussion on young adult fiction, expertly chaired by the writer, editor and translator Daniel Hahn, in which I shared a platform with the novelists Eve Ainsworth, Juno Dawson and Patrice Lawrence. There were around 170 in the audience and we were busy in the book-signing tent afterwards, before being whisked to the Green Room for lunch, where we rubbed shoulders with none other than . . . Benedict Cumberbatch! My next appearance may not be as well-attended, or star-studded, but I’m very much looking forward to headlining at Wordspace, at The Sandbar, Horsforth, on Wednesday – the monthly open-mic event run by Leeds Trinity University, where I teach creative writing. In amongst the poetry and prose performances from colleagues, students and members of the pubic, I’ll be reading extracts from my latest YA novel, Twenty Questions for Gloria. No doubt I’ll bump into Martin Freeman in the gents.